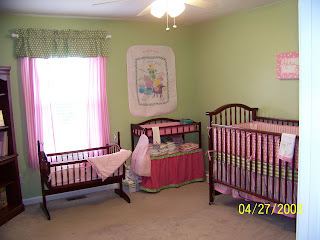 Well here is little misses room. Everything is washed, put together and ready to go! 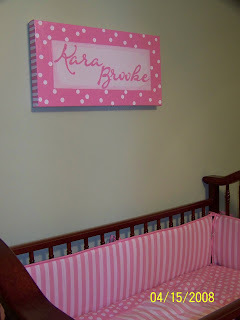 Yes, I know Baw Baw I promised that I would use the blanket but it just looks so darn cute on the wall! 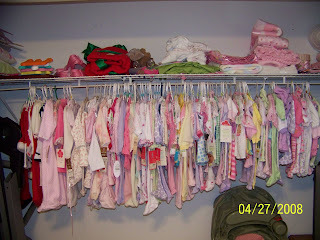 Have you ever seen so many clothes for one child?? So Kara Brooke's bag is ready, I think. But mine, I'm not so sure about. I don't really remember what I needed when I had Kaylee. Of course I have like my toothbrush, toothpaste & mouthwash but other than that I don't know. I do remember I took my own gowns but they only allowed me to wear the oh so fashionable hospital attire! 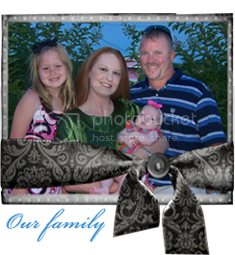 So I need your help...please let me know what you had to have in the hospital. Here I am at 37 weeks....ughhhh....check out that nose and huge arm...........not much longer, she will be soooo worth it! Dr. Moss' office just called and wanted to change my ultrasound to THIS Friday at 8:30. She asked if that would be a problem....PROBLEM.....no way I can't wait to see this big girl besides what else have I got to do! I was at the Dr. at 8:00 am this morning, got to met Dr. Redden, shall I say she is soooo sweet and so young! Anyway, same ole same ole, BP was up a few points, lost another two pounds, Kara Brooke's heartbeat was great and I'm still dilated to almost a 3. My abdomen had grown another 1/2 a centimeter since Friday. And she too thinks KB is already a BIG girl! I have to start checking my BP on Wednesday and call it in each day until Monday. I go back Monday and they are going to do an ultrasound just to see how BIG this baby girl really is and then Dr. Moss will decided if we need to go ahead an induce or what to do from there. Dr. Redden said that she didn't want this little one to get so big that I couldn't have her and then have to have a C-section, I totally agreed! She did keep me on bed rest except I can go to Kaylee's ballgame tonight but she said I can only be up for two hours. 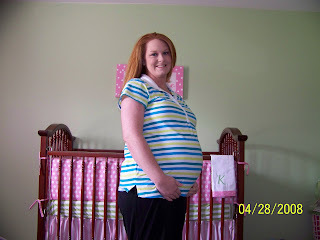 Also, for those of you that know her Kim Redd Dunn was supposed to be at the hospital this morning to start the induction to have her little man. I have not heard anything as of yet but please keep that family in your prayers that all goes well! Well Fri. wasn't so bad. I had lost two pounds of the eleven that I gained last week, my BP was down about 3 points which meant it was still in the normal range. I have dilated to almost a 3 and 70% thinned out and there was still no protein in my urine. Kara Brooke's heart beat was still great and she is showing no signs of stress. While Dr. Moss was measuring my abdomen she was saying, "oh she is going to be a big girl and I do believe I was right, we will not make it to this babies due date." She did take me out of work until 8 weeks after Kara Brooke gets here. She did allow me to go to Kaylee's ball game last night (and yes they did win) but today and tomorrow I am on complete bed rest. 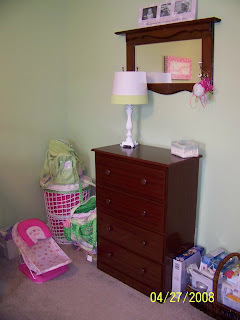 My Mom will be here this afternoon to help get KB's room organized, get some of her little things washed and our bags packed (which Dr. Moss told me two weeks ago to do). I will be going back to the Dr. Monday morning and she said we would just take the rest of the pregnancy day by day. Well yesterday's visit wasn't as great as they have been but it could have been worse. I met Dr. Jones she was really nice and straight forward. My BP was up a little than it usually is but was still in the normal range. We never could get a count on KB's heartbeat because she was so active but Dr. Jones said she wasn't concerned with her it was me that had her worried. My swelling is terrible and if there had been protein in my urine she would have put me on bed rest yesterday. THANK GOODNESS that didn't happen! She is making me go back Friday to see Dr. Moss, so our prayer for the week is that the swelling will go down and they don't put me on bed rest! Other news: Softball season has started for Kaylee; they played in a tournament this past weekend and come out second so of course we were very proud of that. Regular season games start tonight and also her swim team practices started last night. So here is my ever so beautiful painting that my friend Susan gave me at the shower Su nday. Is it not just the sweetest thing ever? And it matches the bedding perfectly! 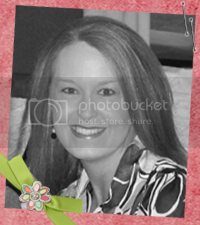 The artist is Kim Wheeler, you should check out her website at www.shopsmallwords.com. She also has a blog spot that you can get to through her website, if you get a chance, please check out her AWESOME paintings, I know you will find something that you just have to have! I know I promised pictures from Sunday's shower and I will get them up soon...give a girl a break....I'm working on a list a mile long of things to do before KB makes her debut!! Went to see Dr. Moss this morning....first things first.....I do have bronchitis. So, I have been thinking, well I have another month to get all of those little clothes washed, her room organized, Kaylee's schedule figured out and all of that stuff, looks like our little one has a different plan for me. I guess I really have to buckle down and get some stuff done. Stay tuned for pictures from my baby shower and thanks to all of you that were there! This post will probably be ramblings of a 35 week prego...but just bear with me as it as been a wild last few days. First of all if you have not already heard I came down with strep throat or maybe bronchitis not for sure which one as I didn't go to the Dr. Friday because I thought I was going to die and also there was freaking tornado's coming into Shelbyville. Dr. Moss' called me in some medicine and told me to stay in the bed the next two days. Mom came and picked up Kaylee and noticed that there was a spot of water on my carpet, of course Kris assumed that Kaylee must have spilled something and didn't clean it up. Later on that night I walked through and the carpet was soaked. I yelled for Kris and said we must have a busted pipe ...oh no water doesn't come up it goes down if a pipe is busted. So Kris goes under the house and comes back and says that I was right and goes to call the plumber. Saturday morning rolls around the plumber gets here checks out every pipe under the house he then pulls out the refrigerator and OH MY GOODNESS......you should have seen the mess!!! Our ice maker pipe had busted, when we have NO idea since the ice maker doesn't put out that much water but we have enough water soaked through our floor that it is coming up through the carpet. Can you believe that???? I guess this means a call to the insurance company Monday morning. So my dear Mother comes back over to clean that awful mess up, do our laundry, clean the bathrooms and mop the floors. Kaylee decided that she would just go back home with Nana and help her with stuff for the baby shower tomorrow. I finally mustered up the strength to take a shower and I am now sitting in bed with Kris' laptop. 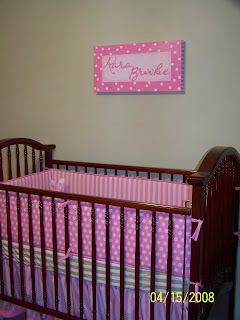 Tomorrow has got to be a better day as we will be attending a baby shower for Kara Brooke... see you all then! Well Kaylee has talked about trying out for the city swim team, "Shelbyville Sharks" for some time. Her good friend Taylor was on the team last year and really enjoyed it. Of course Kaylee loves to swim, my parents have an in ground pool and so does Kris' dad. So try outs where this week and I tried to talk Kaylee out of it saying that we would be too busy with softball and Kara Brooke on the way and so on, so on.....I expected her to be upset with me and argue about it, nope instead I watched the saddest face come over her and tears fill her eyes as she said, "ok Momma I understand", yeah.....what is a Mom to do then.....we went to tryouts today and of course she made it! She did so good. She was first of three to jump in the 12 ft. water and take off freestyle swimming and the kid only had to stop once to take a breath. Then the coach came over and asked if she could swim on her back, just as I was about to say I don't think so, Kaylee says, "yes ma'am"...I'm looking at the woman like well....so finally it was her turn to backstroke and I'm setting there thinking can she really backstroke? She jumps back in the water while underwater turns around so that she is on her back and yes people the kid backstrokes the whole length of the pool without even stopping! I guess she showed me....the coach was cheering her on and then looked at me with the biggest smile! Kaylee gets out of the pool walks over to me and says, "well how do you think I did, I think I did really good! I told you I could swim on my back." I said, " Yes little girl you did fabulous...where did you learn how to do that?" Kaylee said, "I guess my Nana taught me, call her and ask her." So now it is something every night of the week except for Wed. Oh and did I mention that I will be having a baby in a few weeks or that my husband works long hours during the summer? Wish me luck...anyone who does not have something to do any given night just call me......CRAZY I say!!!! HOW 'BOUT THEM LADY VOLS!!!! Dr. Moss was on call so it was pretty much a blur Monday afternoon, of course I waited forever on her and she was with me all of ten minutes, MAYBE! Oh well, I guess I will get my time with her in a few weeks and someone else will be waiting two hours on her. Anyway....she didn't check me, she just checked Kara Brooke's heartbeat, measured my belly and talked longer about my swelling than anything. She wanted to know if I was still working and how long I stand on my feet? Of course I was thinking PLEASE don't put me on bed rest....please don't put me on bed rest......she said just make sure I continue to keep my feet up and lay on my left side as much as possible and something about support hose. My BP and weight was exactly the same as last Monday. 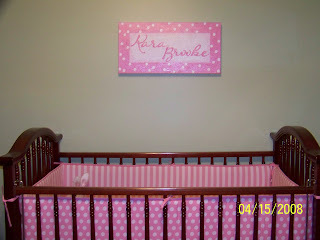 Just wondering what every one's guess is as to when Miss Kara Brooke will arrive? I'm supposed to have about 6 weeks left according to my due date. We just thought it would be fun and interesting to see what your guess will be. Don't try to guess the weight and all of that just yet we will do that in a couple of weeks, just the due date for now. And no.....I'm not going to give you like a million dollars or anything if you are right.....just the satisfaction of having your name posted on our blog as a WINNER.....whehooooo.....I know that is even better than a million bucks! Saw Dr. Moore yesterday, She was absolutely AWESOME! I think she is my new favorite Dr. other than Dr. LaRoche, of course! Anyway, everything was great. BP was 124/72.. picture perfect huh? Kara Brooke's heart beat was 150 and sounded great. She is still hanging out in my right rib and getting bigger every day! Dr. Moore says she thinks this little girl isn't going to be too little at least every bit of what Kaylee was which was 8lbs. 3ozs. She also moved me up a week and said that I need to start coming every week now so that Dr. Moss could check me to see just how big KB is. Of course the swelling is still there but nothing alarming since my BP is so good! Remember I said I was NOT going to take on the cabbage patch look this time.....well Kara Brooke has decided that I need too!! I'll get a picture up soon. The only negative thing Dr. Moore said was that I am about 50% dehydrated.....DEHYDRATED......are you kidding me???? I drink water constantly!!!!! Like bottles and bottles everyday!